Whatever made you decide that buying a used car was the right path, you’ll always find a number of great vehicles from today’s most popular auto brands here at Smith Motor Sales. Dropped off my car in the morning without an appointment due to a last minute schedule change. Was happy to leave it for 2 Days so they could take care of the car at their leisure. They took my car in with a smile and called the very same day to let me know it was ready. Excellent customer service! Everything is taken care of the first time and done right. Can't help but reflect positively on the quality of trained service people and service management at the front desk. Effecient, courteous service from the initial meeting with Dave in the Service Dept. Very comfortable waiting area as well! Easy access to the Dealership via Rt 495. I have owned a vehicle for over 45 years and the professional service I received at this dealership is my far the best in my driving history. 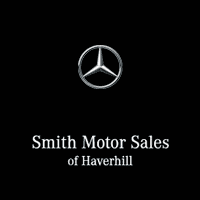 Here at Smith Motor Sales of Haverhill, we always seek to deliver a first-class car-shopping experience to Mercedes-Benz drivers across Haverhill, Lawrence, Andover, Methuen, and Newburyport. We make that possible by providing an incandescent collection of vehicles, second-to-none, hassle-free financing, and top notch service and repairs. By working with our clients in this manner, we’re able to save on precious time, by providing all the essentials for buying, financing, and servicing Mercedes-Benz cars! Speaking of new Mercedes-Benz C-Class C 300 Sedan, E-Class E 300 4MATIC® Sedan, GLS 4MATIC® SUV, GLE 350 4MATIC® SUV and GLC 4MATIC® SUV models, you have got your pick of the bunch of the vehicles in our showroom. No matter if you’re window shopping or looking for a test drive, you can sit back and rest assured that you won’t be let down here at Smith Motor Sales of Haverhill. If any questions come about that you need answering, the luxury vehicle experts on our staff are here to provide to your every automotive need.